The long-exposure image taken with NASA’s Hubble Space Telescope is the deepest-ever picture taken of a cluster of galaxies, and also contains images of some of the intrinsically faintest and youngest galaxies ever detected. The target is the massive cluster Abell 2744, which contains several hundred galaxies as they looked 3.5 billion years ago. The immense gravity in this foreground cluster is being used as a “gravitational lens,” which warps space to brighten and magnify images of far-more-distant background galaxies as they looked over 12 billion years ago, not long after the big bang. Simultaneous observations of this field are being done with NASA’s two other Great Observatories, the Spitzer Space Telescope and the Chandra X-ray Observatory. The assembly of all this multispectral information is expected to provide new insights into the origin and evolution of galaxies and their accompanying black holes. Thanks to the gravitational lensing phenomenon, the background galaxies are magnified to appear up to 10 to 20 times larger than they would normally appear. What’s more, the faintest of these highly magnified objects have intrinsic brightnesses roughly 10 to 20 times fainter than any galaxies ever previously observed. 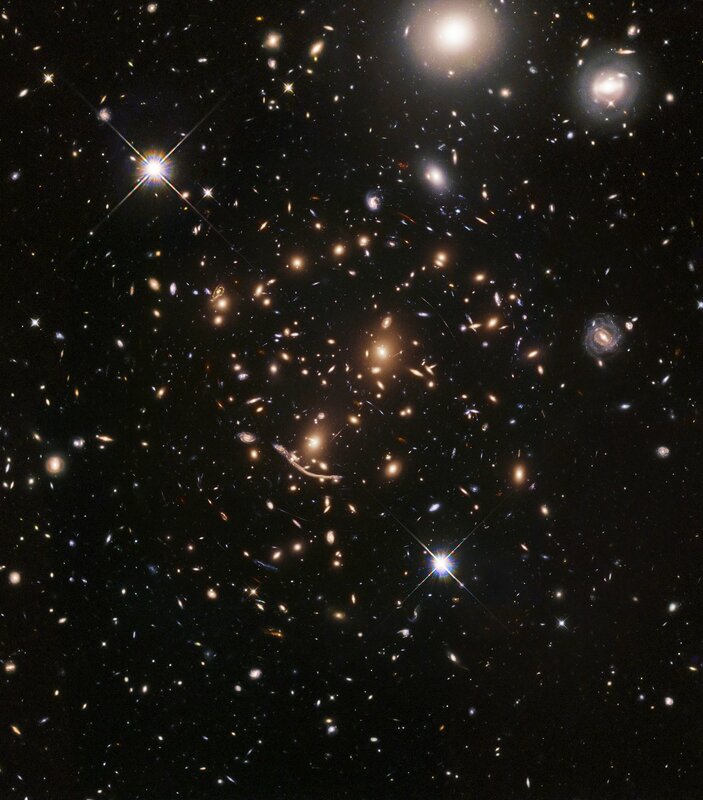 As the Abell cluster was being photographed with Hubble’s Wide Field Camera 3, the telescope’s Advanced Camera for Surveys was trained on a nearby parallel field that is 6 arc minutes away from the cluster. In this field, Hubble resolves roughly 10,000 galaxies seen in visible light, most of which are randomly scattered galaxies. The blue galaxies are distant star-forming galaxies seen from up to 8 billion years ago; the handful of larger, red galaxies are in the outskirts of the Abell 2744 cluster. Hubble will again view these two Frontier Fields in May 2014, but Hubble’s visible-light and infrared camera will switch targets. This will allow for both fields to be observed over a full range of colors, from ultraviolet light to near-infrared. With each new camera installed on Hubble, the space telescope has been used to make successively deeper, groundbreaking views of the universe. To get a better assessment of whether doing more deep field observations was scientifically compelling or urgent, the Space Telescope Science Institute or STScI in Baltimore, Md., chartered a “Hubble Deep Field Initiative” working group. The Hubble Frontier Fields initiative grew out of the working group’s high-level discussions at STScI concerning what important, forward-looking science Hubble should be doing in upcoming years. Despite several deep field surveys, astronomers realized that a lot was still to be learned about the far universe. Such knowledge would help in planning the observing strategy for the upcoming James Webb Space Telescope. The astronomers also considered synergies with other observatories, such as Spitzer, Chandra, and the new Atacama Large Millimeter/submillimeter Array or ALMA. Over the coming years five more pairs of fields will be imaged. The next scheduled target is the massive cluster MACS J0416.1-2403, for which observations are starting this week. Hubble, Spitzer, Chandra, and other observatories are doing cutting-edge science through the Frontier Fields Project, but there’s a challenge. Even though leveraging gravitational lensing has allowed astronomers to see objects that otherwise could not be detected with today’s telescopes, the technique still isn’t enough to see the most distant galaxies. As the universe expands, light gets stretched into longer and longer wavelengths, beyond the visible and near-infrared wavelengths Hubble can detect. To see the most distant galaxies, one needs a space telescope with Hubble’s keen resolution, but at infrared wavelengths. Figure 1: Webb will have a 6.5-meter-diameter primary mirror, which would give it a significant larger collecting area than the mirrors available on the current generation of space telescopes. Hubble’s mirror is a much smaller 2.4 meters in diameter, and its corresponding collecting area is 4.5 square meters, giving Webb around seven times more collecting area! Webb’s field of view is more than 15 times larger than the NICMOS near-infrared camera on Hubble. It also will have significantly better spatial resolution than is available with the infrared Spitzer Space Telescope. Credit: NASA. http://webbtelescope.org/gallery. Astronomers use light to explore the universe, but there are pieces of our universe’s early history where there wasn’t much light. The era of the universe called the “Dark Ages” is as mysterious as its name implies. Shortly after the Big Bang, our universe was filled with glowing plasma, or ionized gas. As the universe cooled and expanded, electrons and protons began to bind together to form neutral hydrogen atoms (one proton and one electron each). The last of the light from the Big Bang escaped (becoming what we now detect as the Cosmic Microwave Background [CMB]). The universe would have been a dark place, with no sources of light to reveal this cooling, neutral hydrogen gas. This image of galaxy cluster Abell 2744, also called Pandora’s Cluster, was taken by the Spitzer Space Telescope. The cluster is also being studied by NASA’s Hubble Space Telescope and Chandra X-Ray Observatory in a collaboration called the Frontier Fields project. Image credit:NASA/JPL-Caltech. These two galaxy clusters are part of the “Frontier Fields” project that obtains long observations with multiple telescopes. To learn more about clusters, including how they grow via collisions, astronomers have used some of the world’s most powerful telescopes, looking at different types of light. They have focused long observations with these telescopes on a half dozen galaxy clusters. The name for this galaxy cluster project is the Frontier Fields. These new images of MACS J0416 and MACS J0717 contain data from three different telescopes: NASA’s Chandra X-ray Observatory (diffuse emission in blue), Hubble Space Telescope (red, green, and blue), and the NSF’s [NRAO] Jansky Very Large Array (diffuse emission in pink). Where the X-ray and radio emission overlap the image appears purple. Astronomers also used data from the the Giant Metrewave Radio Telescope [GMRT] in India in studying the properties of MACS J0416. [Albert] Einstein’s general theory of relativity expresses how very large mass concentrations distort the space around them. Light passing through that distorted space is re-directed, and can produce a variety of interesting imagery. The bending of light by gravity is similar to the bending of light by a glass lens, hence we call this effect “gravitational lensing”. More complex gravitational lensing arises in observations of massive clusters of galaxies. While the distribution of matter in a galaxy cluster generally does have a center, it is never perfectly circularly symmetric and is usually significantly lumpy. Background galaxies are lensed by the cluster with their images often appearing as short thin “lensed arcs” around the outskirts of the cluster. Hubble’s images of galaxy clusters, such as Abell 2218 (above) and Abell 1689, showed the large number and detailed distribution of these lensed images throughout massive galaxy clusters. These lensed images also act as probes of the matter distribution in the galaxy cluster. Astronomers can measure the motions of the galaxies within a cluster to determine the total amount of matter in the cluster. The result indicates that the most of the matter in a galaxy cluster is not in the visible galaxies, does not emit light, and is thus called dark matter. The distribution of lensed images reflects the distribution of all matter, both visible and dark. 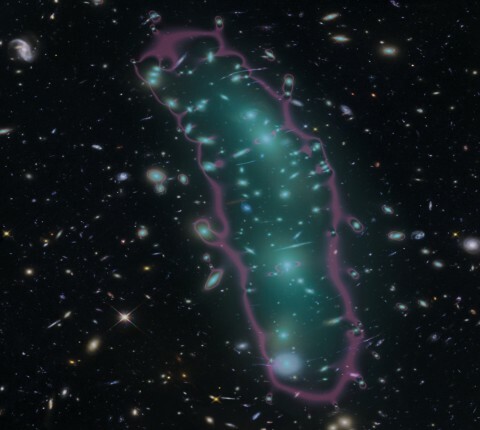 Hence, Hubble’s images of gravitational lensing have been used to create maps of dark matter in galaxy clusters. An international team of astronomers led by EPFL have discovered over 250 of the universe’s earliest galaxies. This sample includes the faintest and smallest of the first-generation dwarf galaxies to be discovered, and offers important clues about the nature of the early universe. Before light travelled across it, the universe was a dark place. For about a billion years after the Big Bang, the cosmos was cloaked in a thick fog of hydrogen gas that kept light trapped. But as early stars began to form, hydrogen began to clear through a process called reionization, letting light escape in all directions and turning the universe transparent. This event played a central role in the formation of the universe as we know it. Now, using observations from the Hubble Space Telescope, astronomers led by EPFL have “looked back in time” by discovering over 250 of the earliest dwarf galaxies, and have also determined that these were vital to reionization. 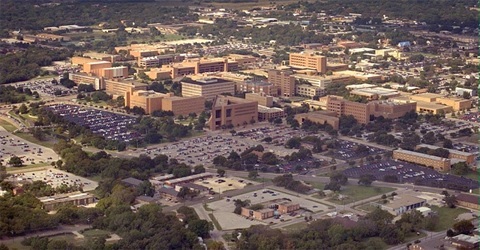 The work will be published in the Astrophysical Journal. Reionization is a mystery in the scientific community. We do know that 400 million years after the Big Bang, the universe was still a very dark place. Protons and neutrons had combined into electrically charged, or ionized, atoms of hydrogen and helium. The ions began to attract electrons, and turned into electrically neutral atoms, creating a thick fog that kept light contained. Slowly, the first stars formed, likely 30-300 times bigger than our own Sun. Being young and huge, they burned bright and brief, exploding in supernovae. The energetic electromagnetic radiation (including ultraviolet light) they released reionized the neutral atoms of hydrogen, and the fog cleared, letting light could travel to the vast corners of the universe. An international team of astronomers led by Hakim Atek at EPFL’s Laboratory of Astrophysics, have discovered over 250 of the earliest galaxies, just 600-900 million years after the Big Bang. The researchers used observations by the Hubble Space Telescope to study the largest sample of the earliest dwarf, ultra-faint galaxies known. But though powerful, the Hubble was not all. The scientists also exploited a cosmic phenomenon known as “gravitational lensing”. Because space has been expanding since the Bing Bang, the oldest objects are further along the “outgoing” direction. Consequently, their light will also be very faint. The team used closer galaxy clusters as a “magnifying lens” to observe older and more distant ones. Being super-massive, the galaxy clusters can bend spacetime. This forms a “gravitational lens” that can magnify the light from other galaxies hiding far behind the clusters. 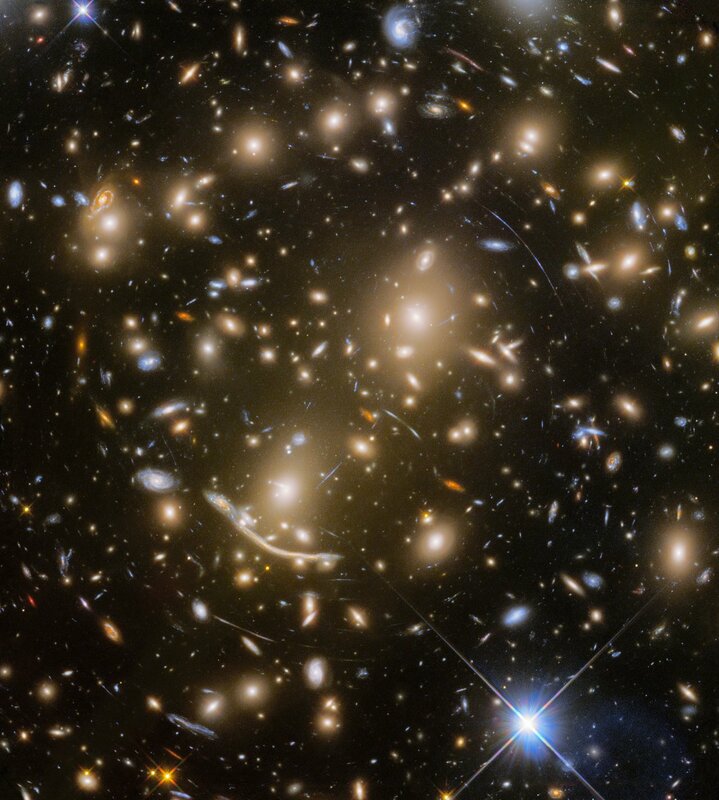 The scientists studied images of three galaxy clusters taken as part of the Hubble Frontier Fields program, a three-year, 840-orbit programme that explores the most distant regions of space through gravitational lensing effects around six different galaxy clusters. “Clusters in the Frontier Fields act as powerful natural telescopes and unveil for us these faint dwarf galaxies that would otherwise be invisible,” says Jean-Paul Kneib, co-author of the study from EPFL. Some of the galaxies the team discovered formed just 600 million years after the Big Bang, according to Daniel Schaerer’s distance determinations from the University of Geneva. This makes them among the faintest of any other galaxy that Hubble has observed for this cosmic epoch. But the accumulated light that these dwarf galaxies emit because of their very large number, could have played a major role in reionization. The study highlights the impressive possibilities of the Frontier Fields program. 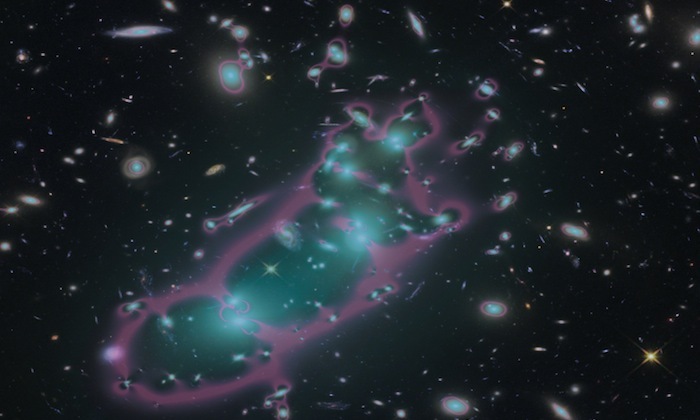 Scientists are currently working with Hubble images on another three galaxy clusters, and more exciting findings lie ahead. “Hubble remains unrivalled in its ability to observe the most distant galaxies and the sheer depth of the Hubble Frontier Field data guarantees very precise understanding of the cluster magnification effect, allowing us to make discoveries like these,” says Mathilde Jauzac, a co-author of the study from Durham University and the University of KwaZulu-Natal. This work represents a collaboration of EPFL’s Laboratory of Astrophysics with the Observatoire de Lyon, Durham University, the University of KwaZulu-Natal, CNRS-Aix Marseille Université, Yale University, Observatoire de Genève – University of Geneva, CNRS-Institut de Recherche en Astrophysique et Planétologie, the University of Hawaii, and the University of Arizona. The projects was funded by the European Research Council (grants “Light on the Dark” and CALENDS), the Leverhulme Trust, the Science and Technology Facilities Council, the National Science Foundation, the Space Telescope Science Institute, and CNRS. 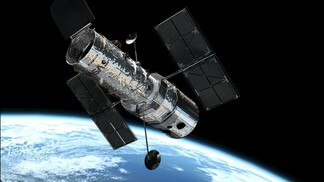 The Hubble Space Telescope is a project of international cooperation between the ESA and NASA. Atek H, Richard J, Jauzac M, Kneib J-P, Natarajan P, Limousin M, Schaerer D, Jullo E, Ebeling H, Egami E, Clement B. Are Ultra-faint Galaxies at z=6−8 Responsible for Cosmic Reionization? Combined Constraints from the Hubble Frontier Fields Clusters And Parallels. Astrophysical Journal (Link to manuscript).